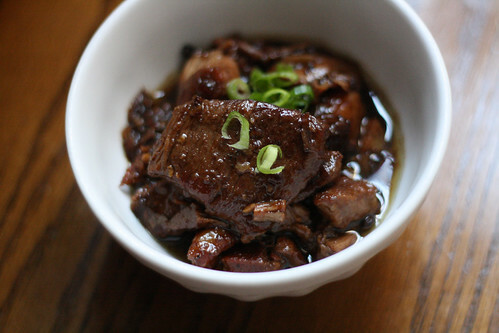 A few months ago, my friend Maila asked me if I’d ever made humba, a type of Filipino stewed pork. I had heard of it, but had never eaten it, so naturally, to me it sounded like a blog post plan. Humba is a Visayan festival dish that seems to be a southern answer to the adobo and kaldereta of the north. 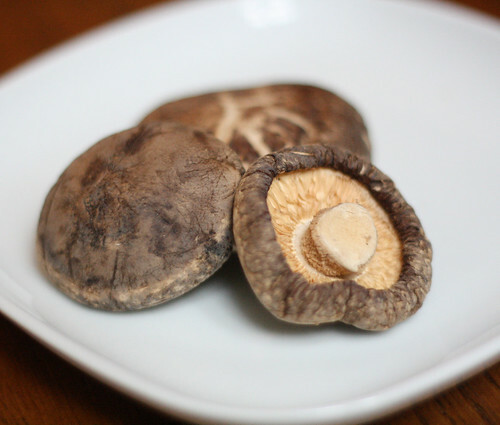 The influence is definitely more Chinese than Spanish; the use of tausi (salted fermented black beans) and the common inclusion of Chinese mushrooms is a central flavor combination for this dish. This stew is also notable for the use of palm sugar, a testament to the Filipino love of salty and sweet foods together. (See my recipe for pork barbecue if the idea of sugar and pork turns you on.) For this recipe, I’ve substituted light brown sugar, but if have access to palm sugar, it would be even nicer in this dish. I was robbed. Do you like pork? Do you like tangy and sweet together? Do you like stews with lots of delicious sauce? This is humba, straight up. Lastly, this dish rocked my world the day after I cooked it. If you have a chance, make it a day in advance and let all those beautiful flavors harmonize in the fridge overnight. Oh yes, it’s worth the wait. Combine the sauce ingredients in a large measuring cup or bowl: water, salted black beans, palm vinegar, sugar, soy sauce, salt and pepper. Set aside. Cut the pork into large chunks. I don’t like small cubes because if you braise it for long enough, you get these nice bits of shredded pork mixed in with the large pieces. Sprinkle with salt and pepper. Heat a heavy Dutch oven over high heat. Add a splash of vegetable oil. Brown the pork on all sides. (Do this in batches so you don’t crowd the pan.) Set the pork aside. In the same Dutch oven, lower the heat to medium and add the onions, scraping the browned bits off the bottom of the pot. Add the garlic and ginger, taking care not to burn the garlic. Add the sauce ingredients, the mushrooms and the bay leaves and bring to a simmer. Add the pork (and any juices that have accumulated. Bring back to a simmer. Reduce the heat to medium-low and cover. (You can also stick the whole thing, covered, in a 250 F (120 C) oven for 2 hours). Simmer for 2 hours. Uncover and raise the heat to medium-high and allow the sauce to reduce by a quarter, or as much as half, so it’s a bit thicker. Meanwhile, remove the mushrooms, halve them, and add them back to the sauce. Serve with lots of rice, maja blanca mais, or my favorite, mashed potatoes. i am officially missing my LoLa’s humba. …can’t wait to try it with mashed potato. I have never tried and made humba but have heard of it. Growing up back home I generally didn’t like Filipino dishes that are more sweet than savory (I liked tapa more than tocino growing up) but this is definitely worth the try. I recently made braised beef with star anise — the other half of the famous Pares dish (not sure if that rings a bell) which I enjoyed a lot and it was more sweet than savory. Looks amazing! I love the sweet and savory combo! That looks wonderful. I can’t wait to try this. Is it similar to adobo? Could I substitute another type of mushroom, or dry my own wild for this? And do you think it would work with other meats as well? 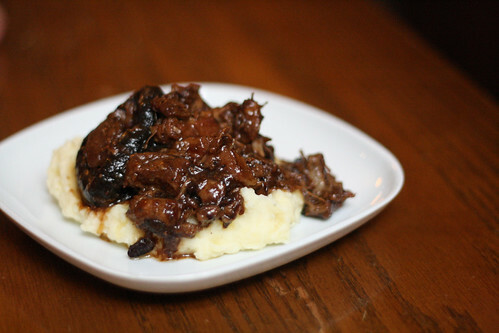 Hi Mike — the mushrooms are actually optional (some humba recipes don’t call for them in fact, but I like the flavor). You can always add fresh mushrooms at the end. I think this would work with other meats, but it would probably fundamentally change some of the flavor. Might be worth trying with game though. Could be interesting. Well I made it. Its quite wonderful. I used palm sugar, couldn’t find the salted black beans(they were out) So I just used the fermented bean paste(soy). My wife loves it, and we’re taking some to her parents who are both from Manilla. Thanks for the recipe, its the perfect blend of sweet, salty and tang. Glad it turned out! The soy bean paste is actually a great substitute if fermented black beans can’t be found. Bringing it to your in-laws from Manila is a huge compliment. That just made my day! doh, just noticed my phone spelled Manila wrong! I’ve had the same sorts of cooking realizations about Northern Italian dishes that my Southern Italian family scoffs at. There’s something to be said for re-discovering your roots… even if you’ve never discovered them before! mmm all your stuff looks great im gonna try out some of ur recipies. thanks for putting up this site btw good stuff. and man the pics make me hungry lol. I was wondering if you know any store in the hague area that sells Phillipines food.. I am looking for something like, tosino, longganisa, and other things I use to eat together with my pinoy friend in San Francisco.. Unfortunately, I don’t. There used to be a Philippine import store in Den Haag but it has since closed. I’ll see if I can find any info about Amsterdam or Rotterdam.